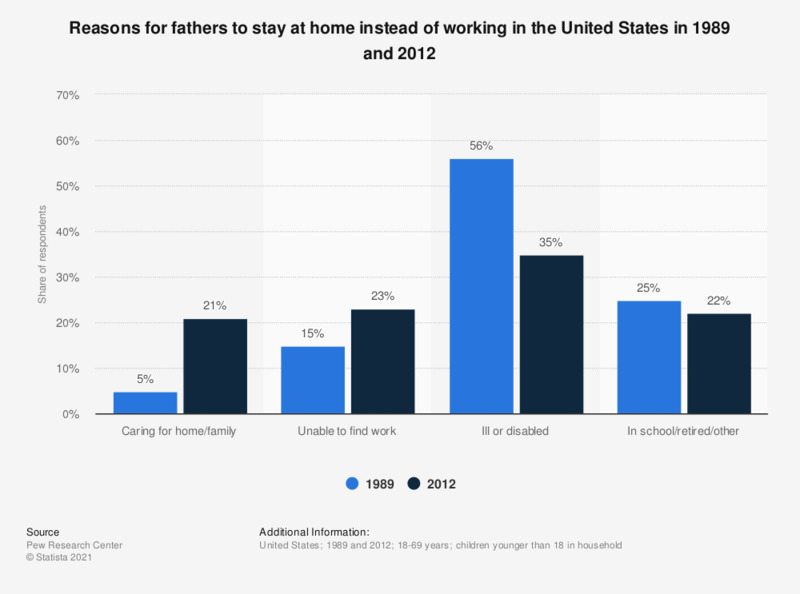 The statistic above provides information about the reasons why American fathers stay at home with their children instead of working in 1989 and 2012. In 1989, 5 percent of stay-at-home fathers stated they were home to care for home/family. In 2012, this percentage had increased up to 21. Everything On "Parents in the U.S." in One Document: Edited and Divided into Handy Chapters. Including Detailed References. Do you agree with the following statements regarding men and parenting? Do you agree or disagree with the following statement: "Employers should make it easier for men to combine childcare with work"? Do you agree or disagree with the following statement: "A man who stays at home to look after his children is less of a man"?